Life insurance companies that utilize direct mail marketing have relied on traditional response models to more efficiently target consumers for whom their products are relevant, attractive, appropriate and affordable. The actuaries at life insurance companies have applied sophisticated data science for years to establish risk, premiums, marketing allowances and more. The actuaries at these companies learned a fundamental truth about consumers: people are different demographically, behaviorally and socio-economically. Women generally live longer than men. Smokers represent an extremely high risk. There are high risk activities that some consumers enjoy more than others. In terms of health outcomes heredity has a role, body mass index has a role, and overall lifestyle has a role. Of course, these factors can be unique to each consumer. Paradoxically, the same principles that insurers use to accurately underwrite or deny life insurance policies also apply to the marketing of those policies. Why? Both analytic processes are attempting to predict an outcome; in the case of direct mail marketing, the outcome is a positive response to a marketing campaign and ultimately a sale. Consumers’ responses to marketing are based on different factors. These factors reflect who they are, where they are, how they behave, their attitude toward the world around them, their family situation, and what comprises their overall lifestyles. This is why “one size fits all” or “out of the box” predictive analysis does not work well when it comes to predicting response behavior. There are methods that utilize multiple segment-based models to determine which models—or combination of models—yield the highest response for a given audience. This methodology is alternatively referred to as ensemble modeling, model stacking, or nested modeling. Each of these specific approaches has subtle differences that are meaningful to nerdy data scientists, but their outcomes are the same: build and combine models that yield the greatest lift across diverse, heterogeneous population by determining market segments or geographic segments and refine the modeling parameters within each of those. Today, we’re going to focus on a nested modeling methodology. Nested models are founded on the premise that different consumer characteristics—whether they be geographic, demographic, lifestyle, attitudinal or behavioral—result in different reasons why people respond or do not respond. The problem with this approach is that the more ingredients that get added to the model soup recipe, the more diluted the outcome of that recipe becomes. It’s like the old data science joke analogy about the fallacy of marketing to the average consumer: you’re standing in a bucket of ice water with your head stuck in a hot oven. On average, you feel just fine! Nested models use the same group of predictors, but instead reserve the most differentiating variables to effectively distribute the target audience into more homogeneous population cohorts. Each group is modeled independently, and then reassembled into a single target audience with optimum response propensity. As we said, variables with significant value differences across different groups make good candidates for nesting within the overall ensemble. In the example below, we see that consumers’ state of residence is a meaningful separating factor because of very different population attributes. In the example below, we are focusing on the 64+ population. Nesting is not necessarily limited to a single variable split; indeed, the modeler can further refine and tune the final model through multiple levels of nesting. This has become a far more feasible approach than in the recent past due to fast (usually cloud-based) computing resources and statistical software applications that facilitate builds like this. 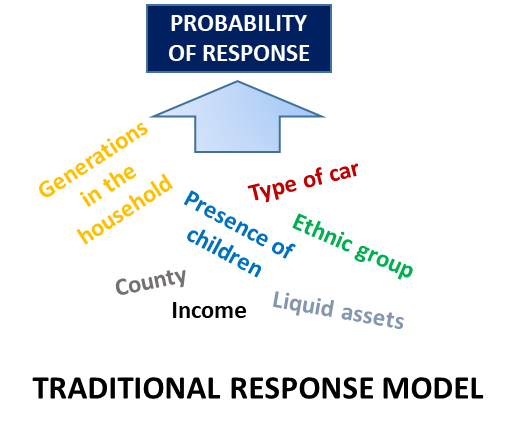 In our example, we find that we can leverage many of these demographic variables to optimize response for our life insurance direct marketing campaign. How does this approach work in reality? 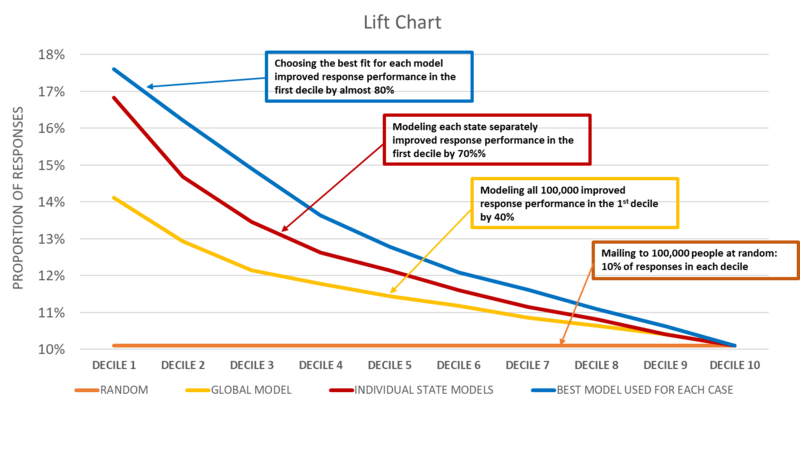 The effectiveness of response models is measured by lift, a statistic that demonstrates how much mailing efficiency the final model yields with actual response rates. 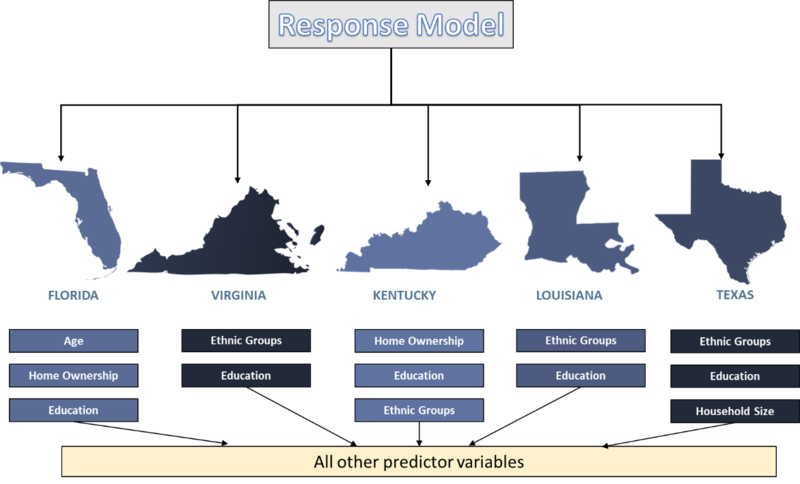 In the chart below, “global model” is the application of a single, traditional response model. 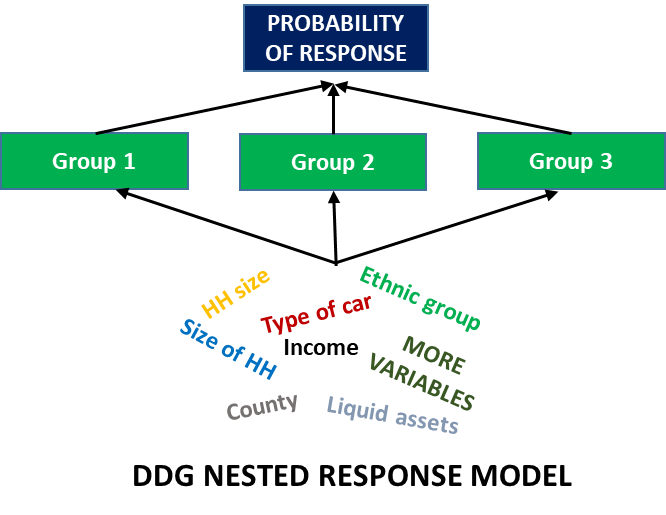 “Individual state models” refers to models constructed like the diagram above demonstrates, and “best model for each case” selects the higher of the two resulting propensity scores for each prospective consumer. The bottom line is that with a smart, thoughtful nested modeling approach, an insurance company would realize enormous savings in its direct marketing costs. Reach us to see how our approach can benefit your business. Dino serves as President of Market Research and Analytics. Dino seeks the answers to questions and predictions of consumer behavior. Previously, Dino served as Chief Science Officer at FGI Research and Analytics. He is our version of Curious George; constantly seeking a different perspective on a business opportunity — new product design, needs-based segmentation. If you can write an algorithm for it, Dino will become engaged. Dino spent almost a decade at Arbitron/Nielsen in his formative years. Dino holds a BA from Kent State and an MS from Northwestern. Dino seems to have a passion for all numeric expressions.